There are several reasons that people are crazy about their cast iron pans and cast iron skillets. Besides being an ideal heat conductor, cast iron cookware heats evenly and consistently, it is relatively inexpensive and will last a lifetime (actually several lifetimes) with proper care, and it is an old-fashioned way to cook fat free. When well seasoned, a cast iron pan will be stick resistant and require no additional oil. 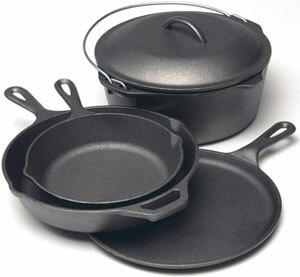 Most bare cast iron pots and pans are cast from a single piece of metal in order to provide even distribution of heat. 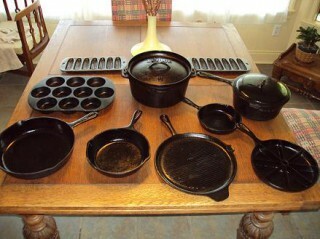 This quality allows most bare cast iron pans to serve as dual-purpose stove-top fryers and oven baking dishes. Many recipes call for the use of a cast iron skillet or pot, especially so that the dish can be initially seared or fried on the stove-top then transferred into an oven, pan and all, to finish baking. Likewise, cast iron skillets can double as baking dishes. Cooks seeking alternatives to toxic non-stick cookware often find themselves in a bind. Stainless steel, which is an healthy alternative, is very expensive, and it does not lend itself well to cooking eggs, pancakes and other dishes that non-stick cookware typically excels at. If you are not clear yet about the benefits of cast iron cooking, here are a few reasons to buy and try cast iron cookware. Replacing a non-stick pan with a cast iron one allows you to avoid the toxic fumes that accompany most non-stick cookware. 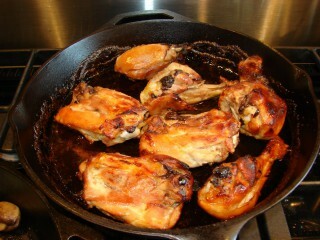 Besides the stove, you can use a cast iron pan skillet in the oven, at any temperature. After seasoning it is nonstick. Cast iron is easy to clean up. Cast iron is sturdy and wears well. Cast iron cookware can be used over any heat source. It is extremely durable and can be passed on through the generations with proper care. Although there are many benefits to cast iron cooking, there are a few drawbacks you need to consider. Cast iron pans are very heavy. Cast iron requires intentional maintenance in order to keep them rust-free and non-stick. Care is needed if you have a glass-top stove. But once you take the plunge, you will wonder why it took you so long to start. Cast-iron pans are only non-stick when they are properly seasoned. Seasoning a pan involves coating the pan with a heat-tolerant fat and then allowing it to bake into the iron, creating a slick surface. Cast-iron pans are often used for high heat cooking, whether you’re frying an egg or baking corn bread. For that reason using a saturated fat, which is more stable over high heat, for seasoning is the preferred choice. Good choices of saturated fats include: coconut oil, lard, beef tallow. Once your pan is clean and dry, and still warm from your stove top, add just enough fat to coat the pan bottom and sides. Then use an old cloth napkin to distribute the oil all over and soak up any extra. Then put your pan in a 250 degree Celsius oven for a few hours. You now have your initial layer of seasoning. You can repeat this process anytime you find that your initial seasoning isn’t holding up. The first thing to know when washing your pan is do not use soap. Soap will remove the layer of seasoning. To clean your cast iron cookware just follow these simple steps. Take a soap-free dish rag and wipe out the pan while running under hot water. Get everything out, but don’t be too rough. Once the pan looks clean place it on a burner over medium-low heat until all of the liquid has evaporated from the pan and it has gotten fairly hot. At this point you can store your skillet in a dry place or do a seasoning upkeep by placing a dab of fat in the hot pan, swirling, and wiping as you did when you initially seasoned it. That’s all. It may sound a bit more complicated than the care of your regular pots and pans, but really it is just a different process and not more difficult. Dit artikel is geplaatst in foods, tips&tricks en getagged alternative, Cast iron, cookware, food, Health, pan, pot, skillet, sustainable, tips, value. Bookmark hier de permalink.